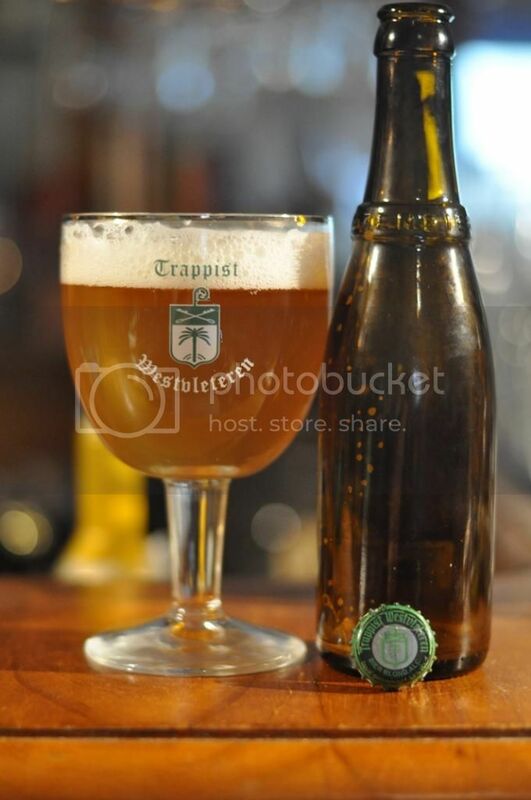 Westvleteren is the holy grail for Trappist beer lovers and the Blonde is the hardest of them all to find! The 12, previously reviewed (badly) here, gets the most acclaim but from all reports this beer is a brilliant example of the style. Westvleteren rose to fame in the early 2000's when Ratebeer.com named it as "The Best Beer in the World". Demand skyrocketed and the Monks had to begin to limit the amount each customer could buy. Despite the surge in popularity, Westvleteren refuse to increase production to meet demand because they "brew beer to be able to afford to be monks." Normally to get Westvleteren you must call the phone number, which is open for very few hours a day and arrange a time to collect your case of beer. People I know have called 300+ times and never gotten through! I'm very lucky to have another chance to try a beer from the Saint Sixtus Abbey! The Westvleteren Blonde pours a hazy golden colour with a white foamy head. The head initially fades quite quickly from 2 fingers down to 1. Strangely the head then seems to settle and lasts throughout drinking. Chalices bring out the best colour in beer, in my opinion, and this beer is no exception; it looks sensational! If if tastes half as good as it looks Westvleteren Blonde will be a great beer! Onto the nose and it's very pleasant. There is nice amounts of grassy, herbaceous and earthy hops that mix in well with the strong peppery aroma coming from the yeast. As it warms citrus becomes more apparent on the nose, as does a light vinous character which is quite interesting. The hops seem to provide much more flavour than bitterness, as I detected very little of the latter on the nose. How does it taste? In a word; sensational! Westvleteren's Blonde is as good a Belgian Pale/Blonde that I've come across! The mouthfeel is light and creamy - and the flavour follows suit. It's light upfront with some citrus, a touch of pepper and even some coriander. The hops begin to come through around this point and they are surprisingly bitter with grassiness the most pronounced element. As the beer warms you get hints of barnyard funk. The hops and yeast are much more prominent than I had anticipated - for the better! The beer is quite spicy and delicious! I remember many of you saying last time I reviewed a Westvleteren beer that I shouldn't be encouraging people re-selling Westvleteren beers as it's against the principles of the Monks. For that reason I won't be mentioning who sold it to me, if you're keen on that information please email me - gus.norris7@gmail.com. In summary; it's a brilliant example of a Belgian Pale Ale/Blonde. Would I pay the asking price again? Probably not, but I'm very happy I did once! You should too if you love beer!